Home » browser » How to Add Captain America's shield on your Firefox to Increase Privacy Protection! 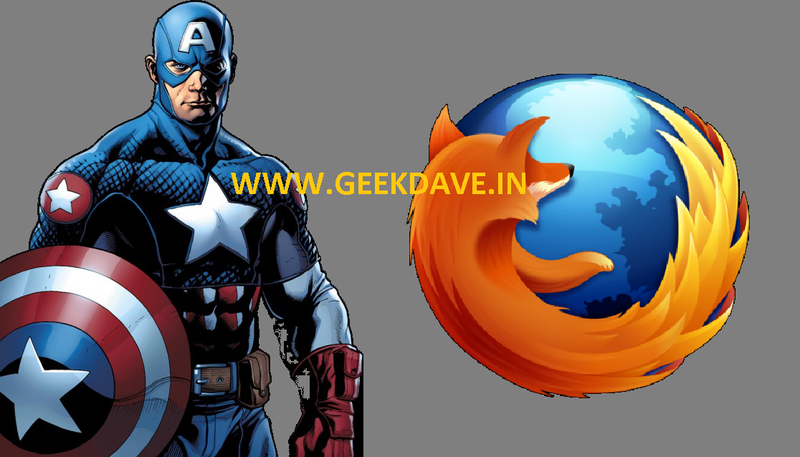 How to Add Captain America's shield on your Firefox to Increase Privacy Protection! Recently i found bunch of websites when i visit those websites i found that there is something missing in my privacy shield.last time i wrote about How to speed up your internet speed 44% by Protecting Privacy! and i also shared a serious privacy issue on Is your Webcam Spying on You? Lets Find out! It will freak out you but also spreads awareness of how people must protect themselves in the internet world. So, How to get Captain America's Shield on your browser? You will need just a Firefox browser. i prefer this browser because it allows you deep customization and Cool Security features too. let's Hit the Firefox icon and start it. in the new tab type "About:Config" and Hit the Enter Key. WebGL is a potential security risk. Disables caching for ssl connections. Disable referrer headers between https websites. This is Mozilla’s new built in tracking protection. Disable Google Safe Browsing and phishing protection. Security risk, but privacy improvement. Number of cached DNS entries. Lower number = More requests but less data stored. Disable Google Safe Browsing malware checks. Security risk, but privacy improvement. Disables website control over rightclick context menu. Disables acceptance of session cookies. Time DNS entries are cached in seconds. Disables recording of visited websites. Disables saving of form data. Disables caching on hard rive. The attribute would be useful for letting websites track visitors’ clicks. If your OS or ISP does not support IPv6, there is no reason to have this preference set to false. To disable DNS prefetching you will need to add network.dns.disablePrefetch as a new boolean preference and set the value to true. Link prefetching is when a webpage hints to the browser that certain pages are likely to be visited, so the browser downloads them immediately so they can be displayed immediately when the user requests it. This preference controls whether link prefetching is enabled. Disable that websites can get notifications if you copy, paste, or cut something from a web page, and it lets them know which part of the page had been selected. WebSockets is a technology that makes it possible to open an interactive communication session between the user's browser and a server.